Do you collect anything? If you do, how did your collection start? Did you sit down and look at a Big Book of Collections and choose something to collect? No, of course you didn’t. Somewhere, somehow, sometime in you life it just hit you that you liked something and were starting to buy, acquire, trade for, or choose more of that something in all shapes and sizes, until you ended up with “a collection”. My sister-in-law had that happen to her and now she has a flamingo collection. I don’t know how it started, perhaps it started with a picture of a flamingo that her daughter painted for her as a school art project? 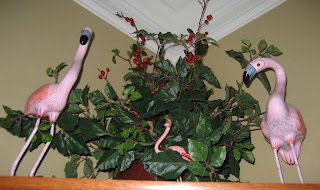 Or maybe the flamingos, mixed in with other ordinary objects in the house and garden, just make her happy? They make me smile. I like how she incorporates the flamingos into her everyday living, and doesn’t try to isolate them all in one place, like she’s running a flamingo museum or something. She smiles graciously when friends and family buy her flamingo stuff, even if she already has the item they got her. We can hardly help ourselves because we think of her whenever we see flamingo items. It’s her “signature item”. 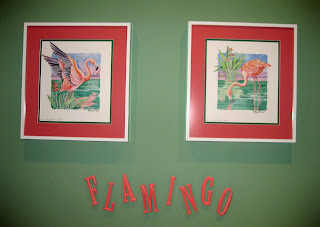 Want to see some of my sister-in-law’s famous flamingo collection? 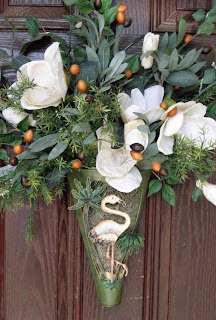 The picture above of a decoration on the front door hints at a bit of fun inside. She has some pictures of flamingos. These are in the master bathroom. Out in back there's a flamingo sculpture. See, not all flamingoes are pink! Back inside, she has several nativity scenes that include a flamingo. And she's cornered the market on flamingo-themed Christmas ornaments. Flamingos keep watch over you in the living room. I swear their eyes followed me as I moved about in the room, probably watching me to make sure I didn't try to take any of the other flamingos. Back outside, there are some stepping stones that look ordinary. Then you get up close and see that those are flamingos. 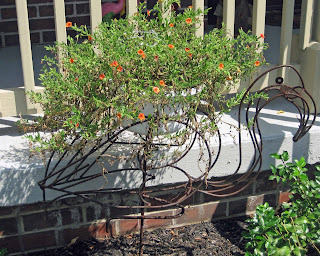 And out front, there is a wire planter shaped like a flamingo. I was going to take it, but that would have been wrong. Gardeners don't steal from other gardens! Earlier today, I saw that Robin(Bumblebee) posted on The Examiner about some flamingo items. Hmmmm, I didn’t see some of those items at my sister-in-law’s today. Maybe if I get her name in the family Christmas drawing, I can order one of those items and finish my shopping early? Or maybe I'll get her a pair of original Don Featherstone flamingos? Love those Flamingoes. Cute. I first collected Blue Bubble Depression Glass because it was blue, and it was cheap. It's still blue, but cheap no longer. I collected roses, roses, roses. Then, I collected daylilies. I have a lot of them. Too many, but I bought more for fall. I use to collect fairys but not so much anymore. The Nativity flamingo makes me laugh! 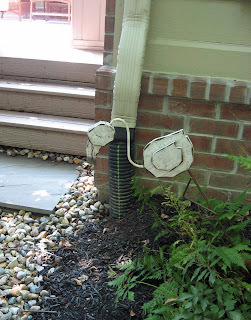 And I like that planter, too. Is it meant to be a topiary frame? I collect poodle things, sort of (pictures here), but I try to dissuade people from buying me stuff just because it has poodles on it. I've seen where that can lead, and it ain't pretty. I fell in love with Harry Potter about eight years ago, and haven't looked back! It seems that almost everyone collects something. I give your sister-in-law credit for great creativity with her collection. 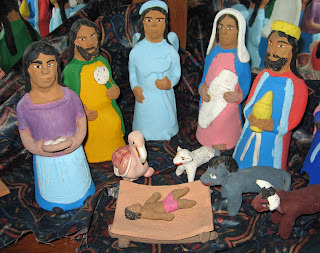 I've never seen a flamingo in a nativity scene. But why not, I say! Books about gardening! And terracotta pots. And I realized today at the nursery that I have a very nice start to a daylily collection. I have a small collection of chicken planters. I wouldlike some more but I haven't found any that I don't already have. I could collect dishes if I had more room. My house is full. Even books I have to be very selective to keep one. I've collected hearts for thirty years or so (not in a Hannibal Lecter sort of way, in case anyone's concerned). Most of them can be found in the downstairs powder room but there are a few here and there throughout the house and garden. Sometime in the last decade I started collecting rocks from places I visit, and asking friends to bring me rocks from their travels. Only a few months ago did it occur to me to take photographs of them so I'd remember their provenance. That flamingo watching over the baby Jesus makes me smile! http://thyme-for-herbs.blogspot.com/2008/05/pink-flamingo.html -- earlier this year. Flamingos are great. 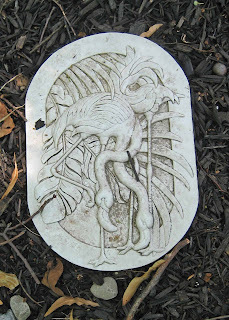 I love the outdoor Flamingo garden ornaments. I collect watering cans! The older the better! Not sure what it is that attracts me. I just love them! I collect sea shells from the beaches I visit. They are kept in a clear glass jar in the restroom. I also collect a piece of jewelry from every new country I visit. It lasts longer than a tee-shirt and is easier to carry. Each time I wear the item, I remember the place where I purchased it. A very nice collection indeed! Very tasteful! She must be a wonderful person... (and your favorite sister-in-law). Thank you for the nice write up! I really could of spent a few hours showing you my entire collection. Including some "original" Don Featherstone flamingos. Carol, you're right. Everytime I see a flamingo I think of the S-I-L. It's hard not to. She has many, many cute, classy flamingos.